This dish is popular through out North India. If you use ¾ cup (180 ml) of water, the texture should be dry. If you want a stew like consistency, add more water. This is an accompaniment to steamed rice. Heat the ghee or oil in a heavy-bottomed 5-quart/liter pan, preferably nonstick, over moderate heat. When it is hot but not smoking, add the ginger, chilies, cumin seeds and black mustard seeds and fry until the mustard seeds turn gray and pop. Immediately add the asafetida and curry leaves, and with in seconds add the tomatoes. Fry for 2-3 minutes or until the ghee separates from the tomato puree. Add the potatoes, turmeric, ground coriander and water and bring to a boil. Reduce the heat to moderately low, cover and cook for 15 minutes. Add the fresh peas, salt and half of the fresh herb and continue cooking, partially covered, until the potatoes are soft but not broken down. 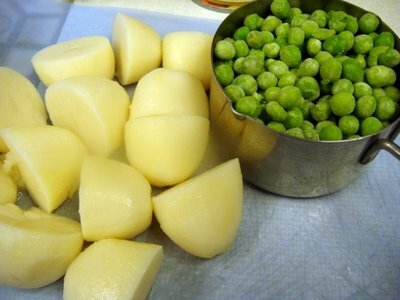 If you are using frozen peas, add them in the last 2-3 minutes. Garnish with the remaining fresh herb and serve.